When it comes to fitness and losing unwanted fat weight, Summer is a motivating time for most people,including myself. Unfortunately, this Summer I got off to a bad start adding unwanted weight via body fat. Like most people, I tend to store fat in and around my stomach, belly and waist area. 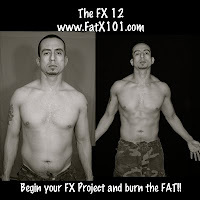 Last week I decided to put myself on the Fat X Program, a.k.a the FX 12 to get rid of that unwanted belly fat and regain my six pack abs. I completed Day 8 on Sunday and decided to take a progress picture before completing fat burning FX workout 8. As you can see in the picture, I seem to have burned off most of the fat and unwanted weight I slapped on in the last few months, but there is still more to go. My goal is to get the best results on the FX 12 for me yet. 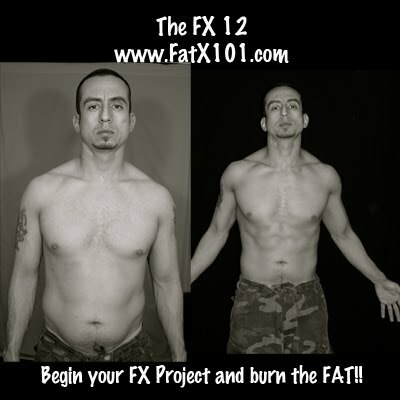 Here is a before and after picture of my last Fat X Project using the FX 12 I completed a few months ago.